I celebrated this week of planning with working on my Vision Board. Eating healthy was in my vision. 10 Way to Organize your Weight loss. I have been completing my journal. Just trying to figure out how to record the eating out food. CB - Awesome for the Journaling. Mine is like a movie big jumps in time through out it. A) Meal/Snacking Planning is going good most of the time. Bought good snacks to stay away from the candy. B) I have been tracking all my meals and snacks in Sparks for my Journaling. Celebration plan for me on Sunday will be creating my Vision Board for 2018 with my friends. I am working on Meal Planning. 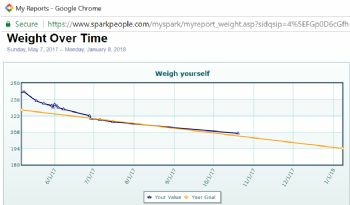 I use the tracker in Sparks for both my weight and food tracking when I focus on weight lose. I also still use a planner I can write in. 1)	Declare your plan type in the MC weekly section. This does not need to be the complete plan. Is yours a meal plan, exercise plan, learning plan, and journaling plan? This is your choice. 2)	Plan should include 5 to 7 action items that you would like to share with the team during the week. 3)	Post during the week your progress. A tip for meal planning. 1)	Decide how you are going to be accountable to yourself and celebrate your success of your plan. Post how you are going to celebrate your success. 2)	Record your results – This can be simple tracking using the Spark Trackers for weight or nutrition. I found that sometimes I looked at the pictures of myself and did not see the change because it was slow. The biggest change I saw was when I looked at one of my tracking reports. This helped me see how much progress I made and how close I was to my goal. I set up new goals for myself this year.